Halachically (according to Jewish law), a child becomes a Bar/Bat Mitzvah automatically at the age of thirteen without need of a ceremony or celebration. At that age, a Jewish child becomes obligated to fulfill his/her responsibilities as a Jew. In our modern world, we no longer send our thirteen year olds off to apprentice to acquire a trade or profession, nor do we marry them off. 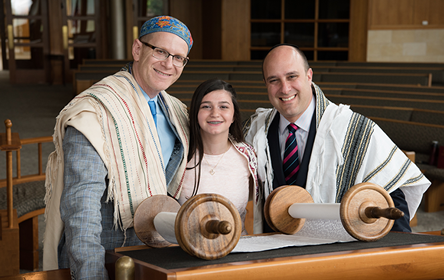 Instead, a Bar/Bat Mitzvah celebration offers the family, the child, and the congregation an opportunity to recognize this important milestone in Jewish life. The service when we celebrate that simha empowers the family to affirm its connection with the Jewish past and to proclaim its commitment to a Jewish future. Please contact Leslie in the Clergy Office to let us know about your upcoming simha and help coordinate your event. The goal of celebrating within the community is to strengthen the bonds of our Har Shalom family. Our congregation celebrates together as your family marks this life-cycle. We look forward to celebrating with you as we journey through the Bat/Bar-Mitzvah path, together. At Har Shalom, the child is welcomed into the congregation at a communal service. The service is not designed around the Bar/Bat Mitzvah; instead the Bar/Bat Mitzvah assumes a variety of roles in an established, traditional service—roles that a child will be able to repeat through participation in future services throughout his/her life. These roles often include reading from the Torah, chanting the Haftarah, leading prayers, and delivering a d’var Torah. In this way the child begins a journey directed at lifelong participation in Jewish communal life. The family, too, is encouraged to participate in those roles.